FOR the past two years, Julie Borger has stood on the frontline advocating for Queensland’s politicians to reject proposals to legalise abortion. Now the Cherish Life Queensland president has written a book defending the sanctity of life based on biblical ethics, and warning of “a culture of death” threatening to engulf our society. “This is the greatest genocide in the history of mankind and it is going under the radar,” Mrs Borger said. The Battle for Life is a call to arms to every reader – a reminder that concern for the unborn can be found throughout scripture, and that it is a Christian obligation to protect life and speak up about it in an age where life has lost value. “It is a spiritual battle for life we are facing – every time someone is pregnant now or facing end of life,” Mrs Borger said. Observing trends in European countries, Mrs Borger describes a bleak winter of attitudes that now threaten Australia. “Children are not being born in the numbers required to sustain productivity and prosperity,” she said. “The aged and infirm are at risk of being euthanised. The Battle for Life is packed with personal stories, some from Mrs Borger’s own experience growing up and as a member of a Church community, punctuated by Scripture passages that provide a solid foundation as she mounts a case for each of us to act to “save the souls being lost”. “First of all I would like Christians to see that it is a really good thing to pray for life on a regular basis and secondly to come in to the battlefield when it is needed,” she said. Mrs Borger cites the example of three dedicated Christians who prayed outside a Brisbane abortion clinic several times a week before opening hours. “They did this for ten years. And that clinic closed,” she said. There are personal stories of hope – like her friend from university days who was pregnant, tearfully considering an abortion, and seeing no way around it. Mrs Borger explains how God intervened, giving her the words to support her young friend. Then came the girl’s courage to face her mother and finally came a promise from the father-of-the-baby to care for her and the child. The couple have now been married for 41 years, have five children and seven grandchildren. “Even today, it brings joy to me every time I think about that family,” Mrs Borger said. There is even a letter from God – a caring letter of acceptance, comfort and support to any woman contemplating an abortion or grieving and in pain because of one. “Please believe me that I will forgive abortion, I will forgive your casual sexual encounters. I will forgive all that is asked of me from a contrite heart,” the letter reads. “I also have a most perfect plan forming for him or her and I promise that as you walk with me I will lead you to pastures where you will be refreshed and where your child will be fed. Mrs Borger suggests to readers to cut the letter out, photocopy it or keep it to pass on “whenever you get the chance”. In the latter chapters she turns her mind to consider end-of-life matters, just as euthanasia is gaining political traction in states across Australia. She considers the terms “quality of life”, and “dying with dignity” that have crept into popular conversation. “These are secular concepts and we Christians need to have our eyes open to them,” she writes. “Nowhere in Scripture does it allow us to consider that the life of a person can be weighed and measured by us; and if it falls short, then be discarded. As president of Cherish Life Queensland, Mrs Borger’s “battle for life” is real and happens every day. She is lobbying Queensland parliamentarians, trying to win their support to reject any proposals that could result in laws allowing abortion and euthanasia. She expects the Queensland Law Reform Commission to deliver draft legislation for proposed abortion law reform to parliament by the end of June. It could mean that MPs are presented with a new bill aimed at decriminalising abortion within the second half of this year. “I would love for churches – when people get together as a prayer community – to be praying for life, to be praying for the young girls who are facing unplanned pregnancy, that you will be in their situation, show them how they can move forward,” Mrs Borger said. 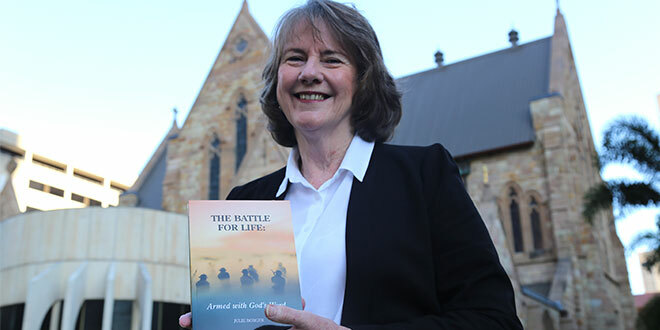 The Battle for Life is available for sale by contacting manager@livingtheworld.com.au or from St Paul’s Book Centre, 277 Elizabeth St, Brisbane.